Does anyone beat MacMulkins price? Bought my 09 and 13 from Tommy Jr at Macmulkins. They are now about 1,100 miles from where we retired to (middle Tennessee). Any forum dealers closer who sell at the same price of less? If you negotiate, many dealers will beat them. They are very competitive but you need to add the cost of a courtesy delivery, travel to pick it up and drive home or truck delivery. ... or have it shipped. I just bought a 2017 Grand Sport from MacMulkin. They just loaded it on the transport today. 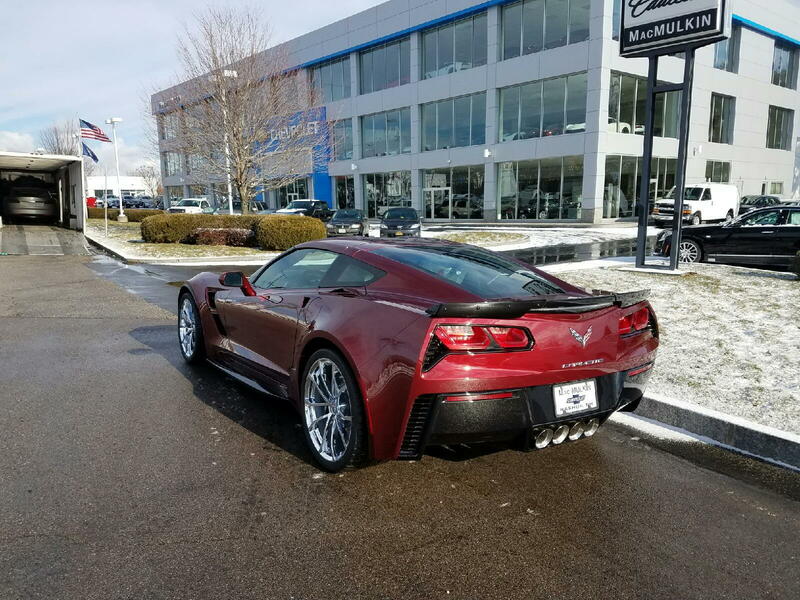 Pic below... Before I purchased I compared exact models and options (2LT, LBR, Nav/PDR, Chrome Wheels) to 5 dealers... 2 local Northern VA dealerships and 3 more distant, but well known dealers (Kerbeck, MacMulkin and Criswell). After comparing the 2 local dealerships NOT EVEN Close, nor were they even interested in dealing. Even had one state that if I didn't buy from them they would not service any corvette purchased at another dealership (There are names for those kind of folks). Criswell was the first to drop out... not because of price but for some reason they have a very low inventory and what I wanted was not even close to what they had. MacMulkin had exactly what I wanted, and they were the lowest priced of all. HOWEVER, the catch was I am having the Corvette shipped from NH to VA. That is $995, but MacMulkin does not charge ANY fees docs or not. Listed price is the sale price. After comparing the Kerbeck w/doc fee VS MacMulkin W/Shipping costs.... MacMulkin still better deal by $500. Now that is not much and I can't say exactly what my experience with Kerbeck would have been since I didn't buy there. What I can Say 100% is that my over the phone, sight unseen buying experience was absolutely beyond reproach! Mark, Kenny, Tommy Jr were TOP-NOTCH! Best vehicle buying experience I have ever had, hands down. I'm not sure where the confusion was, but we only have a $379 doc fee and that's only if we do your DMV work. If you are paying cash, you can do your own tax and tag work. However, if you take a loan we will collect your sales tax and DMV work. We use to give the option until a few people (you know who you are) said they would do their own DMV and didn't put the bank lien on the title and the bank came after us. So, $379 plus your tax and tags but only if we do your DMV. Dave I stand corrected. In the end you guys are what? #1 and #2 right? Your prices are super competitive and I don't thing anyone could go wrong with either. I bought one from MacMulkins a couple months back. Great price, no fees and super easy deal. Even after paying Plycar $2500 to haul it out here I was still money ahead of the local clowns. Got exactly the car I was looking for. Bought my 14 a few months ago from Jessy and Kenny and loved the experience. No bs or fees. I also highly recommend having expel done by their guy while your up there. Phenomenal job, no visible lines and no sales tax for the install. I placed an order on a new GS Convertible from Kerbeck today! I'm pleased with the deal and how I was treated. Dave, please tell Ron I said thanks again. I'm extremely excited. It was tough deciding between the top three. You can't get as big as any of these places are without great deals and treating people right. And I'm sure there are lots of other good dealers too. I think you really can't go wrong with one of the forum dealers. That said, my friend and I placed an order with one of the forum dealers and it seemed it would never be picked up by GM due to no allocation. Eventually my friend bought his car off the lot from Criswell and I pulled my order and went with Criswell. Abe at Criswell is great, my friend has his car and mine has a TPW of 2/6! I don't blame the first dealer, but I could not understand how a large forum dealer could not get allocation. Were you happy with your previous experiences at MacMulkin? If so and if it was me, I'd go back to them with the confidence that I'll get a good deal and a good experience. I bought my C7 in October last year from Jesse at MacMulkin. Easiest vehicle transaction I have ever done, lowest price and no fees at all. Used Delta miles to fly up and Hilton points for hotels. Drove it back to Atlanta via the Blue Ridge Parkway in VA and NC. Beautiful weather, top off, leaves changing colors. Best 1200 miles ever. I bought my 2013 427 vert from MacMaulkin, deal and service was flawless. Flew out from Cali picked it up and drove it back across the country. Big fun! Clspht had a great plan unless you buy locally. Museum delivery seems way better than having it shipped! I purchased from MacMulkin last month. Was a very simple process however communication during the process could have been more timely. Had many questions that I needed answered and I would get a response 2 days later, that was a little stressful. I'm in North Texas and nobody could get close to their pricing, even with $1795 charge for shipping I came out $5000 ahead. Part of that deal was the $2000 GM loyalty cash back. This savings was on a base model. Quick Reply: Does anyone beat MacMulkins price?